I was so completely flummoxed with my boy Kory in last week’s class/league play sequence that I’m now pretty much determined to take a new approach to teaching him to wrap a turn (left or right) on a jump. So here’s the idea. I’m going to isolate the jump wing and basically just teach him to circle it using a “Wrap” verbal. Even as I write this it occurs to me that I might want to have separate verbs for wrapping left and right. Maybe it’s “Wrap” to the left and “Swing” to the right. I dunno. It’s a winter project. I want the same behavior performance when I put the obstacle together with both wings and a jump bar. 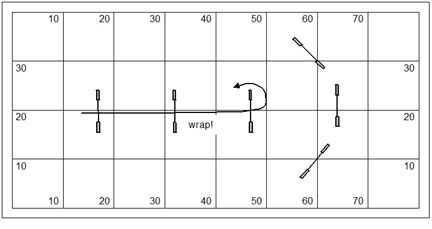 “Wrap” means jump, turn tightly (left?) and come back towards me. In my down time in NY LaGuardia airport I came up with the fanciful bit below. I don’t use many canned sequences anymore in seminar work. Though, I do have a few favorites to pull out from time to time. The fundamentals are always revealed. This sequence should give me the opportunity to introduce some basics of handling strategy and mechanics. Everything is presented with architectural balance and clean simple lines with only a couple subtle riddles. In the afternoon I should like to do the sequence I described in my post “Agility Handling 101” a couple days ago. Questions comments & impassioned speeches to Bud Houston BudHouston@hughes.net. The Country Dream web store is up and running. www.dogagility.org/newstore. You know… I have five volumes (over 100 pp each) of The Joker’s Notebook available on my web-store at an embarrassingly inexpensive price. These are lesson plans suitable for individual or group classes for teaching dog to work at a distance. This entry was posted on September 18, 2011 at 8:13 am and is filed under Dog Agility Training. You can follow any responses to this entry through the RSS 2.0 feed. Both comments and pings are currently closed. Why not say “left” or “right”? Thanks for the explanation on how to train this very important move. The skill I’m trying to teach is a very tight wrap around the jump. 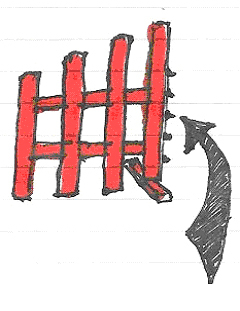 “Left” or “Right” have a considerable ambiguity in terms of degree of turn. And to tell you the truth, with the absolute directionals, I don’t necessarily want a tight wrap. The turn might be very subtle. 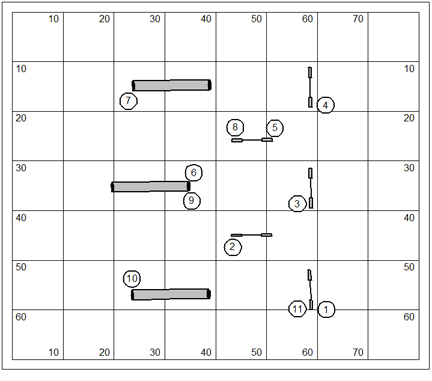 Seems to me that you should be able to handle this sequence by standing within the box formed by the 3 jumps and the middle tunnel. Now that you point it out… I see the logic completely.